About two weeks ago, I gave a keynote on Positive Psychology at the Fifteen Seconds Festival in Graz/Austria. It covers a short introduction to Positive Psychology, some scientific facts on the relationship between treating your employees exceptionally well and the financial returns of a company (based among other things, on the research of Prof. Alex Edmans), and a model of exceptional leadership based on ideas of Prof. Michael F. Steger. CEO, want your Bonus? Then make your Employees happy! A couple of days ago, I introduced the term Return on Flourishing (ROFL) as a key financial performance indicator for future-minded leaders. My post described how programs that are designed to foster employee wellbeing can be assessed pertaining to their financial returns. 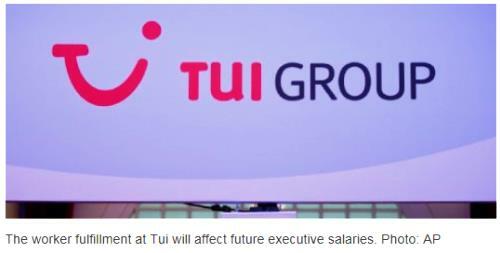 To that effect, today I was delighted to learn that German tourism giant TUI Group plans to base a part of their top executives´ bonus salaries on employee satisfaction in the near future. Yes, you´ve read correctly: employee satisfaction, not customer satisfaction. Besides being a progressive and bold move in terms of leadership culture, it´s also a clever campaign in terms of profitability – as studies have shown time and time again there´s a strong link between employee satisfaction, customer satisfaction and profitability. Here, you can read a German article about it in Die Welt, one of Germany´s premier daily newspapers. And here´s an English press release. Enjoy!